MILLINGTON, Tenn.- Hundreds of International Hot Rod Association (IHRA) Summit SuperSeries track champions, along with Summit Team Finals divisional champions from around the United States, Canada and Aruba, gathered at Memphis International Raceway Oct. 19-20 for the IHRA Summit SuperSeries World Finals. Representing nearly 100 IHRA-sanctioned tracks, drivers traveled from all over North America and Canada, coming from as far north as Palmer, Alaska making the nearly 4,000-mile trek and as far south as Oranjestad, Aruba, to the largest and most prestigious bracket racing championship in drag racing. of Around Aruba Tours, IHRA Ironman, Gold Card. 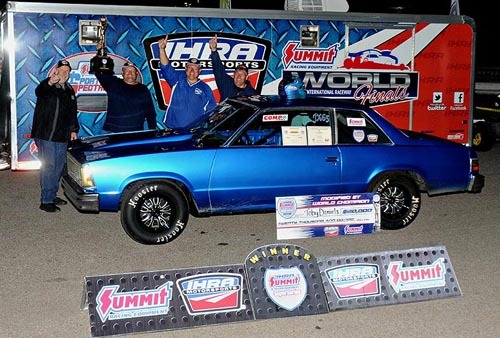 Dale Scates from Center, Texas representing Pine Valley Dragway won the Top World Championship. Toby Daniels from Barbourville, Ky., representing London Dragway captured the Mod World Championship. Kyla Feit from Wisconsin Rapid, Wis. Representing Great Lakes Dragway won the Junior Dragster crown. Scates defeated Dale Foss from Wickliffe, Ohio representing Dragway 42 in the Top finals with a ..021-reaction time, 5.07-second run at 124.33 mph. Feit went down the track in 7.897 seconds at 81.97 mph against a 7.90 dial-in. 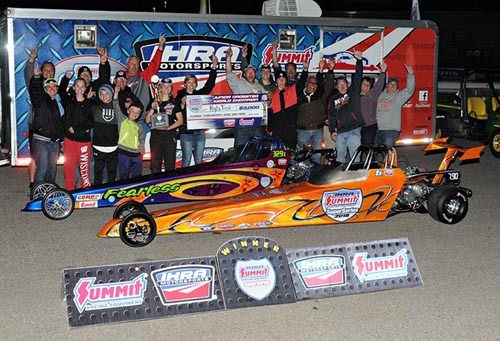 of Imagine That Customs and the Computech Data Maxx Jr.
data logger plus $3,000, IHRA Ironman, Gold Card and more. 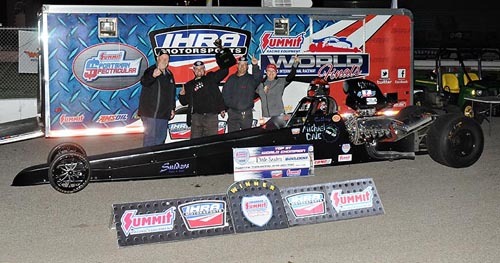 With the World Championship, Feit won a custom-built IHRA Junior Dragster built by American Race Cars featuring a custom paint scheme from Imagine That Customs, Computech Data Maxx Jr. data logger, $3,000 from Summit Racing Equipment as well as the world championship Ironman Trophy and diamond ring. Tropicana Resorts, More 4 Less car rentals and the crew of Don Flip Racing Team.